In Australia, we drive on the left hand side of the road. That means that our cars have the steering wheel and the controls on the right hand side of the car. When I was growing up, I thought this was the way every country’s roads and cars were organized. Then, as a child in the 1960’s, I can remember seeing my first left hand drive car. That’s when I learned that not all countries were the same with respect to which side of the road you drive on. Much later, in my thirties, my wife and I went on our first holiday to Europe and we hired a car to get around. That’s when I experienced the difference first hand. I must say it was a bit of a shock. 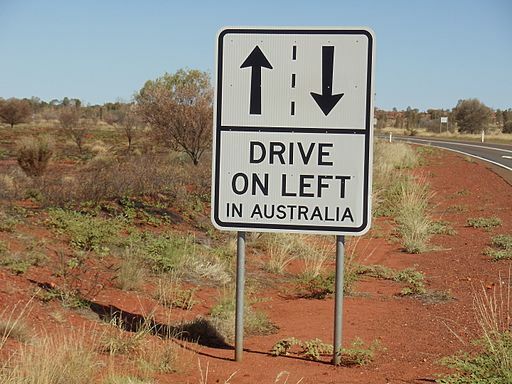 In Australia, don’t forget to drive on the left. Photograph by Joshua Aldrich [Public domain], via Wikimedia Commons. Actually, about two thirds of the world’s population live in countries where the cars drive on the right hand side of the road. So Australia’s approach is in the minority. Those countries which were colonized by Britain drive mostly on the left hand side of the road. This includes Australia, New Zealand, South Africa, India, Pakistan, Thailand, Malaysia and Singapore, just to name a few. In total, there are 76 countries or territories which drive, like Australia, on the left hand side of the road. However, more than 160 countries or territories drive on the right hand side of the road. This includes America and almost all of Europe. In Europe, there are only 4 countries that drive on the left hand side of the road, and they are all islands. They are Britain, Ireland, Malta and Cyprus. It’s interesting that, after you have been using the roads in Australia for a while, certain behaviours become automatic. For example, in Australia, when a pedestrian crosses the road, they look first to their right. That’s because the traffic nearest to them is coming from the right. Looking first to the right becomes a habit. It’s what you were taught in school and you don’t even think about it. But when you are crossing the road in, for example, Germany, looking to the right first is incorrect and, for the pedestrian, actually quite dangerous. There you have to look to the left first. That’s where the closest traffic is coming from and that is where the danger is for a pedestrian. It can take some getting used to. You have to think hard about it. When I am on holiday in Germany, I feel a little unsure when crossing the road. My habit tells me to look to the right, but I know I have to look to the left. I end up looking many times in both directions and then finally crossing the road with more caution than I normally would do in Australia. Likewise for a driver. An experienced driver learns certain habits and can do certain things without thinking about them. For example, imagine you are turning left at a T-junction where there are no traffic lights. In Australia this is the easiest and least dangerous turn. All you do it look for oncoming traffic from your right, then turn left when there is a gap in the traffic. Turning right is the more dangerous turn in Australia. Then you must look for gaps in the traffic coming from both directions. In Europe however, it is the left turn which is the more dangerous. It’s a little scary for us visitors from Australia. You are always under pressure and feeling stress when you are trying to see a gap in fast moving traffic coming from two directions. That is when your habits from your Australian driving experience can put you into a dangerous situation. I can remember one situation where I turning left in Germany at a T-junction with no traffic lights. It was a very busy road with many large trucks and the gaps between the traffic weren’t very frequent. I almost turned into the oncoming traffic in the wrong lane. Luckily, I stopped myself at the last second, took a deep breath and then waited patiently for a bigger gap in the traffic. After that, I tried to stay on the main roads with traffic lights wherever possible while we were driving in Germany. Roundabouts are also different. In Australia, you go clockwise. In Europe and America, you go anticlockwise. I can remember when my wife and I first visited Germany in the early 1980s. We picked up our hire car at Frankfurt airport and had planned to drive across Germany into Austria to visit my wife’s relatives. I will never forget the stress of driving for the first time on the other side of the road in a strange car. Almost immediately we had to drive through large roundabouts to get onto the autobahns. I had to constantly talk to myself to make sure I was driving in the correct lane. The slow lane on a freeway in Australia is on the left, but in Germany that is the fast lane. You must stay out of that lane unless you are driving fast. I soon learned that a rapidly approaching car in my rear vision mirror, with lights flashing, meant I was in the wrong lane. Of course there are many ways in which driving in Australia is the same as in all other countries. The car’s pedals are the same – the right pedal is the accelerator, the middle pedal is the brake and left pedal is the clutch (if the car has a manual gearbox). The rules of the road seem to be largely the same, from my experience of driving in Europe. Now, when I am on holiday in Europe, I always travel by train. Especially in Germany, Austria and Switzerland, I find the trains to be excellent and a stress-free way to travel. However, in Australia, I think cars are still the best way to travel long distances and the best way to see Australia. Podcast 88 Quiz - Did you understand the podcast? True or False? – If the cars in a country drive on the left hand side of the road, then the steering wheel of the car will be on the right hand side of the car. True or False? – When Rob first drove a car in Europe, he found it easy. True or False? – Most countries in the world drive on the right hand side of the road. True or False? – India was not colonized by Britain. True or false? – In Singapore and Malaysia, the steering wheel in cars is on the left hand side of the car. True or False? – If an Australian drives a car in Europe, they must change some of their driving habits. True or False? – When driving in Australia through a T-Junction, it is more dangerous to turn left than it is to turn right. True or False? – When Rob drove in Germany for the first time, he found it very stressful. True or False? – When driving a car in a different country, you will find the position of the pedals will be the same. True or False? – Rob thinks that using the trains in Australia is the best way to travel in Australia. T-junction = when two roads meet at 90 degrees, like the letter T.
Hello Rob! The podcast is great, excelent and very interesting! You are excetely my teacher! The best way to learn English is your podcasts! I am learning English by listening and reading. New words remember easy because it is interesting to getting new information about Australia and in the same time studing English. Thank you buddy! I want you to have a good health and desire to make new interesting podcasts! Have a good day! PS Sorry if I made some mistakes in my message. Many thanks for your message and your kind words. It’s great that you are enthusiastic about learning English. You are already having success, as I have easily understood your message. Well done. Don’t worry about mistakes, we all make those. Being understood is the most important thing. Over time you will make fewer and fewer mistakes. Good luck with your English studies. I am glad to see this new record published. Just would like to say thanks for your dedication and this series of audios have helped me tremendously. I am from China and haven’t got a good chance to learn the genuine English spoken by the native speaker. I believe that listening, reading and memorising your essays will greatly help me to integrate myself to Australia. Thanks and best wishes for you and your family. Many thanks for your kind message. I am very pleased that you find my podcasts useful.